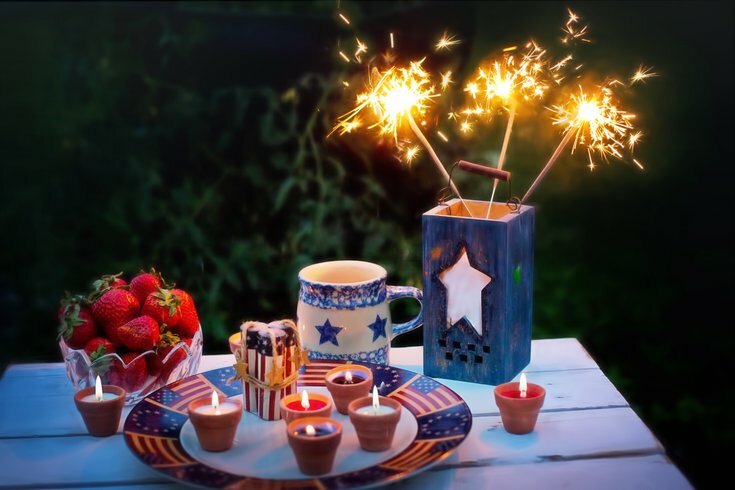 There are many creative ways to spice up your Fourth of July party. Fourth of July parties are great for a number of reasons. You’re outside and it’s not snowing or cold (thank you, Mother Nature.) Your only obligations are to drink something refreshing, watch fireworks, and maybe eat a hotdog. Life is hard, right? But there are some people who would rather throw a party with a bit more flavor to it. You’re classy, you know it, and you don’t want to just throw any run of the mill Fourth of July barbecue. We get it. Here are some tips to adding some class to your Fourth of July party. We’re all celebrating for the same reason, but that doesn’t mean we all have to celebrate with the same exact theme. You can go classic with the patriotic bunting, but if you want to do something a bit more elegant, design the party with outdoor lighting, such as red lanterns, and pump up the garden with some potted plants. Shoot for red, white, and blue flowers, but don’t necessarily feel like you have to represent all the flag colors in your garden. For example, red flowers, blue dining ware and white chairs or benches is a nice way to add in all the colors without it being overwhelming. Even though beer tends to be the signature drink at Fourth of July gatherings, why not shoot for specialty cocktails? Try a speciality punch like the Casa Independence Day from Town and Country or the Firecracker Fizz. Not into mixed drinks? Why not just drink some nice quality bourbon or vodka on ice? Check out locals Federal Distilling’s Stateside Vodka and Manatawny Still Works brand of bourbon and whiskey to keep it in the American and Philly family. Instead of just boring, old cheeseburgers, have a line of condiments and add-ons that would make even Bobby Flay jealous. Bleu cheese, peppers, aged cheddar, a fried egg, sautéed onions, barbecue sauce, avocado, and if you really want to impress your friends, make some candied bacon as well. Check out Iron Chef Alex Guarnaschelli’s candied bacon recipe here. Feel out your friends before asking them to bring stuff. Unless you know you can completely rely on them, sometimes it’s just easier to do it yourself, especially if you want it done a certain way. You also can’t be too picky about what people bring. Do you really want to be that friend? Let your friends know ahead of time what you want to see at the party. Ask if they can bring a specific thing, but if they can’t, don’t sweat it. The key to good hosting is to make your guests feel welcomed and not like they owe you something.